There are many incredible hikes in Tenerife, that it would be a real pity to miss out on them while on the island. Tenerife is the biggest and most populated of the Canary Islands. It’s capital is Santa Cruz the Tenerife, though San Cristobal de la Laguna, where the University of La Laguna was founded in 1792 and a UNESCO World Heritage Site is probably the most popular city to visit. Tenerife also has some lovely villages. And last but definitely not least, the hikes in Tenerife are among some of the best in Spain, thanks to Mount Teide (the highest volcano in Europe) and Teide National Park, a UNESCO World Heritage Site. Other than volcano hikes, there also are some nature hikes and coastal trails. This post highlights 10 fantastic hikes in Tenerife, and includes some tips on other places to visit, where to stay on the island, and other useful information. What are some of the nicest hikes in Tenerife? The hike to Guajara, Tenerife’s 4th highest peak which is located on the south eastern edge of Las Cañadas ridge, in Las Cañadas National Park, isn’t long. It’s just about 9 km. The ascent isn’t much, really. But the altitude makes it challenging and altitude sickness may cause problems. What makes this one of the top hikes in Tenerife is the incredible view. On a clear day, it’s possible to see Las Cañadas, Mount Teide and the south coast of Tenerife. The best time of the year to attempt this hike are May and June, when there’s beautiful flowers on the way; or September and October. Make sure you are prepared for sudden weather changes, and keep in mind that the temperature on the summit may be 20 degrees colder than on the south coast. Dress appropriately and carry an extra layer. Once at the summit you will find a small abandoned stone shelter which is a good place to keep out of the wind and have lunch. The descent follows the same path, or alternatively there is an old goat-herder trail following a ravine on the west side, which however is very hard to follow. You will get why I say that it’s one of the most difficult hikes in Tenerife! One of the nicest hikes in Tenerife is the 14 km coastal walk from Los Crisitanos to Las Galletas, right at the doorsteps of the biggest tourist resorts on the island. It goes through some beautiful nature reserves and offers incredible views of the south coast. The trail starts in Casa Carolina, an old villa on the sea front; it goes past the beach and towards Montaña Guaza – a protected natural area. There is a trail on the right which is less known and goes towards the cliffs. Once there, the trail goes around the plateau through a rocky landscape surrounded by cactus. It eventually goes down through a steep slope towards Palm Mar, through the nature reserve of Malpais de la Rasca, where there’s the beautiful lighthouse. From there, the trail goes all the way to Las Galletas, a lovely fishing port, crossing some banana plantations and abandoned fields. It’s one of the nicest excursions in Tenerife. When hiking in Tenerife, Teide is a must! las Montañas Negras are located in the north-west of Tenerife and owe their name to the color of the volcanic ash that formed them. They include Volcan de Carachico, whose 1706 eruption caused the destruction of the port of Garachico. One of the nicest hikes in Tenerife is the one that starts in San Jose de los Llanos, just north of Santiago del Teide, and following a circular route goes to Montaña Bilma, then turns east to get to a forestry track that runs along Canal Vergara. On this part of the hike, the view spans so see the lava flaws of the 1909 eruption of Chinyero (the most recent eruption in Tenerife). On clear days, it’s possible to see all the way to the valley around Santiago del Teide, Mount Teide and Pico Viejo. The last part of the trail is downhill, going to San Jose de Los Llanos. The overall hike is 14 km but the ascent of just 200 meters makes it one of the nicest, easiest hikes in Tenerife. Immediately east of Mount Teide there is Montaña Blanca, the third highest peak on the island. The hike there is one of the easiest yet most rewarding hikes of Tenerife among those in Teide National Park. It is a dirt track that for around 7 km zig zaps up the back of the mountain, going by the Huevos de Teide (giant boulders that were ejected during volcanic eruptions). Along the way it is also possible to see the lava flows on the side of Mount Teide. Roque del Conde is one of the most famous landmarks of southern Tenerife. This mountain that looks over the resorts of Los Cristianos and Playa de las Americas. It’s possible to walk there (it takes around 3 hours) and from the peak there are gorgeous, 360 degree views of the south of Tenerife. This makes it one of the nicest excursions in Tenerife. It is a 6 km hike on a paved path starting in Vento – there’s signs pointing to it from the main road in Arona. Here the altitude is around 600 meters above sea level, while at the peak it is around 1000. The trail goes through the Barranco del Rey, a deep gorge cutting through the southern side of the Tenerife, and then up the plateau. One of the nice things about hiking in Tenerife is that the trails go through villages and beaches. The Masca Barranco hike goes from the picturesque Masca, thought to be Tenerife’s prettiest village, to the beach, through a prehistoric landscape. The walk to the beach takes roughly 3 hours, and once there it is possible to either take the boat to Los Gigantes or to walk all the way back. One of the most popular hikes in Tenerife is the one from Arona to Ifonche. It is a 9 km hike that goes along a well marked trail, and starts 1 km north of Arona, following an old goat herder track all the way to Ifonche. The way back is via Barranco del Rey gorge. It is the first leg of the longer walk to Adeje, Taucho and Vilaflor. One of the easiest excursions in Tenerife is the one that starts in Las Lajas, the barbecue area of Parque Natural de la Corona Forestal, at about 10 km from Vilaflor. The first part of the trail is quite easy, on a good dirt track where you will cross paths with many mountain bikers in the winter months. You will be crossing the Pasaije Natural Protegido (Protected Natural Space) of Ifonche, as well go by the resorts of Los Cristianos and Playa de las Americas. After walking for about 2 hours, the view is obscured by the Alto de Chimoche, which reaches 1500 meters of elevation. It takes around 4 hours to walk the roughly 12 km. This 9.4 km walk is thought to be one of the top hikes of Tenerife. It goes through ancient forests and steep mountain ravines to then get to a hamlet where the locals still live in cave houses, much like it can be seen during the Tamadaba hike in Gran Canaria. The Fortaleza trail is a nice and easy one – the only thing that may cause a bit of difficulty is the altitude. It’s one of the nicest excursions in Tenerife to explore the north crater wall of Teide and Teide National Park. The best time to go hiking in Tenerife is towards the end of the spring or the beginning of autumn, when temperatures are milder. Throughout the winter, the temperatures are mild; whereas in the summer it’s really hot and it is not recommended to go hiking. Santa Cruz the capital of the island, is a great starting point when hiking in Tenerife. It is a nice place to visit, with a good selection of tourist attractions. The main one is Tenerife Auditorium, designed by famous architect Calatrava. Espacio de las Artes, the art museum, is another must. The city centre is packed with beautiful squares and lovely small streets. San Cristobal de la Laguna is the second most important city on the island, home of the University of La Laguna, and a UNESCO World Heritage Site since 1999. It used to be the capital of the Canary Islands. The Old City boasts some beautiful churches (especially the Cathedral) and some nice squares. Many villages can be seen when hiking in Tenerife. The nicest ones are Masca, which is perched on a rock: it is a series of narrow, cobbled alleys and overflowing gardens; Garachico, which is a tiny port that survived a volcano eruption; Tegueste, which is known for its farmers’ market; and Vilaflor, which is the highest village in Spain and is entirely surrounded by the forest. Last but not least, Granadilla is home to a beautiful baroque church dating back to the 18th century. Tenerife is a popular tourist destinations. As such, there is a very good selection of accommodation options, for any kind of traveler and any budget and even for those who go hiking in Tenerife. Dream Sky is a beautiful apartment in the centre of Santa Cruz. Click here for the latest rates and here for reviews. El Jostel is a good hostel in Santa Cruz. Click here for the latest rates and here for reviews. Casa Armonia and Casa Dona Carmela are two lovely guest houses in Santa Cruz. Click here for the latest rates and here for reviews. B&B La Laguna is a great pick in San Cristobal de la Laguna. Click here for the latest rates and here for reviews. La Laguna Gran Hotel is the perfect option to pamper oneself in La Laguna. Click here for the latest rates and here for reviews. Hotel San Roque is a great choice in Garachico. Click here for the latest rates and here for reviews. Gran Melia Tenerife, in Alcala, is a great option for families. Click here for the latest rates and here for reviews. El Tejar, in Vilaflor, has a spa. Click here for the latest rates and here for reviews. Hotel Rural Vilaflor, in Vilaflor, is a good budget option. Click here for the latest rates and here for reviews. Wild camping is not allowed in Tenerife. Although there are meant to be a few campsites on the island, at the time of researching for this post it looks like most of them are closed for refurbishment. The online list seems rather outdated. Tenerife has two airports: Tenerife South Airport, and Tenerife North Airport. South Airport is connected to mainland Spain and the rest of Europe through regular and budget flights, though some of them are only seasonal. North Airport is not as well connected. Several sites have information on the hikes in Tenerife, but the information is scattered at best. There is a Walk This Way Tenerife on the best trails of the island that can be bought online on Amazon. Another site is Tenerife Hiking, but it’s outdated, with the last post being published in 2008. Several companies offer guided hikes in Tenerife. 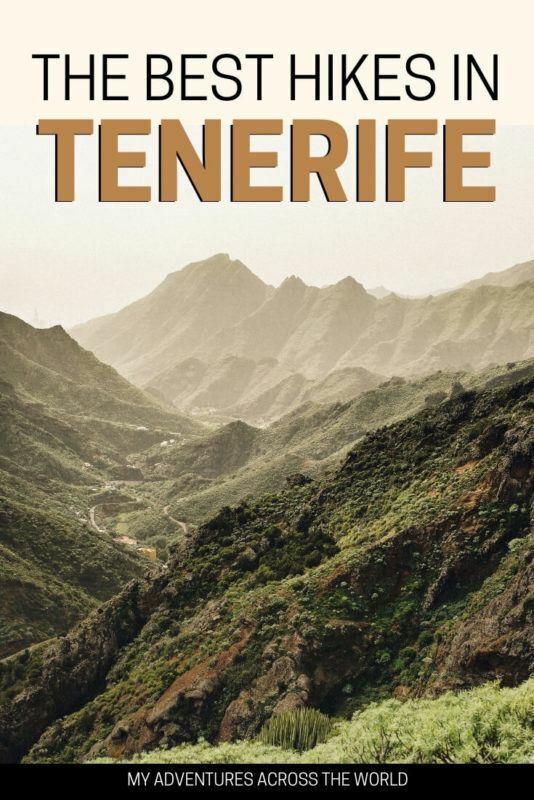 Among them, there are Tenerife Hiking and Macs Adventures. For more hikes in the Canary Islands, read my posts on the best hikes in Lanzarote and the best hikes in Gran Canaria. Also check my post on why I do not recommend hiking alone. Have you ever been to Tenerife? What are your favorite hikes in Tenerife?